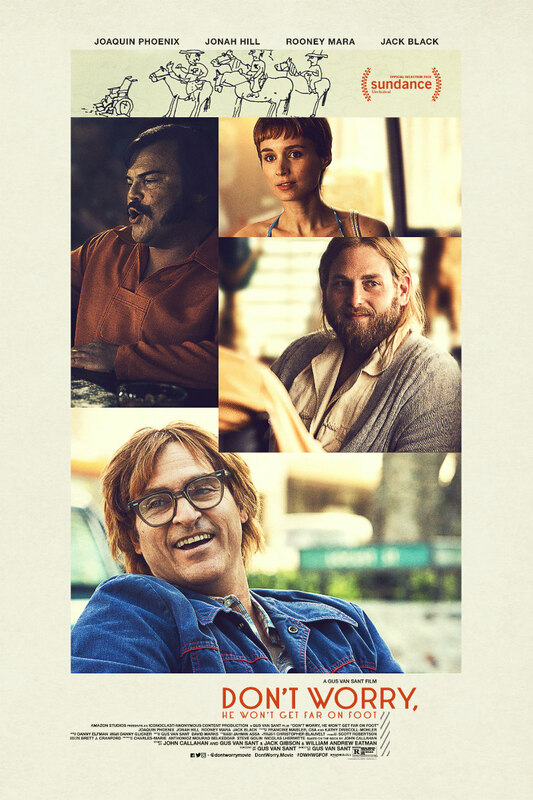 New trailer and poster for the true story of disabled cartoonist John Callahan. Director Gus Van Sant brings the true story of cartoonist John Callahan to the screen in Don't Worry, He Won't Get Far On Foot. Joaquin Phoenix plays Callahan, who was rendered wheelchair bound following a drink-driving incident and subsequently discovered his talent for drawing, becoming a popular cartoonist. The film also stars Rooney Mara, Jonah Hill and Jack Black. Don't Worry, He Won't Get Far On Foot is in US cinemas July 13th, with a UK/ROI release yet to be announced. The last day Portland slacker John Callahan is able to walk, he wakes up without a hangover — because he’s still drunk from the night before. That night at a wild party he meets a wisecracking drinking buddy (Jack Black), who insists they leave for an even better party he knows about. But when his new friend dozes off at the wheel, John wakes up confined to a wheelchair with only partial use of his arms. Though he initially has no intention of getting sober, he reluctantly attends a 12-step meeting run by a charismatic and dedicated sponsor named Donnie (Jonah Hill) and reconnects with Annu (Rooney Mara), a therapist he met at the hospital. With their encouragement, John finds that love is not beyond his reach and discovers a hidden talent for drawing, channeling his playful personality into crude, politically incorrect — and often hilarious — cartoons, which develop a national following.